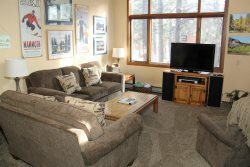 Standard Unit, 2 Bedroom with Loft and 3 Bath Town home located in the Scenic Meadow area of Mammoth Lakes. Sleeps up to 8 (approx. 1300 sq ft). You enter the unit on the first floor which has both bedrooms and two full bathrooms. The second floor is the living room, kitchen, dining room, and third full bath. The unit has a woodstove in the living room. The third floor is the loft (open to the living room by a half wall). The master bedroom has one queen bed, the second bedroom has two twin beds and the loft has four twin beds. There is not a foldout couch in the living room. But the living room sofa and loveseat are new as of March 2012. There are 4 Flat Screen TVs including a large flat screen in the living room, and then TV's in each bedroom and the loft. VCR/DVD, stereo/cd. Phone in unit 760-934-7944 . Wifi Internet Access in the unit. There are a maximum of two outdoor parking spaces available. Snowflower Features a Hot Spa and Sauna, Summer Time Only Swimming Pool, and Tennis Court. Coin-operated laundry facilities located in the common area near the office. There are no Buses, Motorhomes, Trailers or any type of Towed Vehicles allowed on the Snowflower property. COMPLIMENTARY INTERNET and CABLE TV are provided, however NO REFUNDS will be given for connectivity problems or Internet failure. TOT LICENSE 807-SF45. Thank you so much! The process was so easy and your place was cozy, clean, and adorable. The host was so quick to respond when I had questions and the check-in/out directions were simple and a breeze to follow. Great location and cozy spot! Would definitely stay again. A great condo and a bed for every one of our 7 guests! Right by the hot tub and pool so all in all an excellent location. Ample parking and a great little condo with a fully equipped kitchen. Less than 5 minutes drive into town / the bus stop is right outside. Thanks for a great stay! The cabin was extremely spacious. The rooms were perfect. The location was right across from the hot tub which cant be beat after a long day of skiing. The bus line comes right through the main intersections so it was a quick jump on to the slopes. Over all a great experience and i will for sure be booking with them again! Thank you for sharing your beautiful home. Close to town and hot tub. This townhome is a must for a large family or a group of friends heading to Mammoth. Each room had a full size bathroom. The loft has four twin beds, which the kids loved. Centrally located to just about everything. The kids especially loved the heated pool just right outside the front door. You wont be disappointed with this cozy and spacious townhome. Thank you. My family loved your place.